Sluggish sales in January pushed up wholesalers' inventories, a trend that could translate into slower GDP growth for the first quarter. An economic slowdown in January due to harsh weather, slower global demand, and the now-settled labor dispute at the country’s West Coast ports unexpectedly caused wholesalers’ inventories to rise on slower sales. The Commerce Department’s Census Bureau on Tuesday said that January 2015 sales of merchant wholesalers were $433.7 billion, down 3.1% from the revised December level and down 1% from the January 2014 level. Sales of electrical and electronic goods fell 4.4% from last month and sales of metals and minerals, except petroleum, were down 4.1%. Sales of nondurable goods dropped 4.6% from December and were down 6.7% from a year ago. Sales of petroleum and petroleum products were down 13.5% from last month and sales of drugs and druggists’ sundries dipped 3.6%. 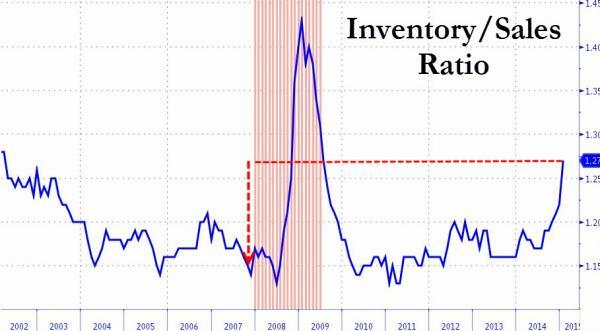 In another negative signal, total inventories of merchant wholesalers were $548.7 billion at the end of January, up 0.3% from the revised December level and up 6.2% from the January 2014 level, the Census Bureau said. January inventories of durable goods rose 0.6% from last month and climbed 7.7% from a year ago. Inventories of electrical and electronic goods were up 2.4% from last month and inventories of motor vehicle and motor vehicle parts and supplies were up 1.6%. Inventories of nondurable goods were down 0.1% from December, but were up 3.7% from one year ago. 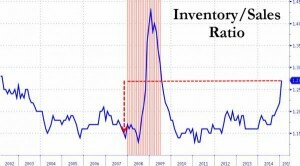 The seasonally adjusted January inventories/sales ratio for merchant wholesalers, except manufacturers’ sales branches and offices, hit 1.27, compared with 1.18 a year ago, the Census Bureau said.